Adored throughout time, roses of all colours are known for their beauty and strength. But the red rose stands alone as the true symbol of true love! 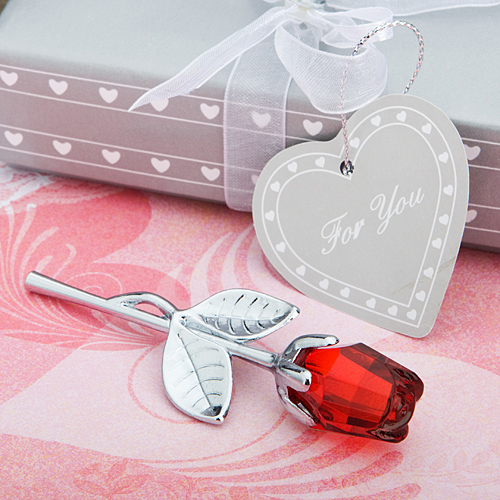 Measuring 3.5" x 1 1/8"
Choice Crystal rose favour features a glistening, multifaceted red crystal glass rose bloom atop a chrome finish silver metal stem with outstretched leaves. A red letter choice for weddings, showers and more, each crystal red rose favour makes for a stunning presentation nestled in white satin inside a Choice Crystal signature two piece silver box with a heart design. Wrapped with a white organza and satin bow with a crystal heart accent on top and an attached silver heart shaped "Thank You" tag.